Ptolemy is the English name for Claudius Ptolemaeus. He was a Greek who probably lived and worked in Alexandria, in Egypt. He lived from about 85 to 165 A.D. He is famous for his work on astronomy and geography. Very little is known about his personal life. He was an astronomer, mathematician, and geographer. He described in his writing the Greek or geocentric view of the universe. Earlier Greek philosophers changed the old assumption of a flat Earth below a "vault of the heavens". They substituted a spherical Earth surrounded by a Celestial sphere. Ptolemy elaborated these two spheres into a system of nested spheres. He also thought out and described the apparent motions of the planets as they were known in his time. Ptolemy explained and extended Hipparchus's system of epicycles and eccentric circles to explain the Earth-centered theory of the world. Ptolemy's system involved at least 80 epicycles to explain the motions of the Sun, the Moon, and the five planets known in his time. He believed the planets and sun moved around the Earth in this order: Mercury, Venus,Sun, Mars, Jupiter, Saturn. This system became known as the Ptolemaic system. It predicts the positions of the planets accurately enough for naked-eye observations, so it seemed accurate at the time. This is described in his book Mathematical Syntaxis (widely called the Almagest), a thirteen-book mathematical treatment of the phenomena of astronomy. It contains a wide variety of information ranging from earth conceptions to sun, moon, and star movement as well as eclipses and an explanation of the length of months. The Almagest also included a star catalog containing 48 constellations, using the names we still use today. 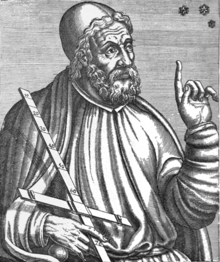 In addition to his well known works in astronomy, Claudius Ptolemy was very important in the history of geography and cartography (Making maps). He was influential up to the 16th century when his ideas were disproved by Nicolaus Copernicus. Ptolemy of course knew that the Earth is a sphere. Ptolemy's is the first known projection of the sphere onto a plane. His Geography remained the main work on the subject until the time of Christopher Columbus. But he had Asia extending much too far east, which may have been a factor in Columbus's decision to try to reach India by sailing west from Europe. The Ptolemaic explanation of the motions of the planets remained the accepted wisdom until the Polish scholar Copernicus proposed a heliocentric view, or sun-centered view in 1543. It should be noted, too, that Ptolemy's system is actually more accurate than Copernicus's. The heliocentric formulation does not improve on Ptolemy's until Kepler's Laws are also added. Ptolemy may not actually have believed in the reality of his system. He may have thought of it only as a method of calculating positions. Image from Andreas Cellarius Harmonia Macrocosmica, published in 1660/61. Chart showing signs of the zodiac and the solar system with world at centre. Ptolemy's 150 CE World Map (redrawn in the 15th century). This page was last changed on 13 September 2018, at 13:57.